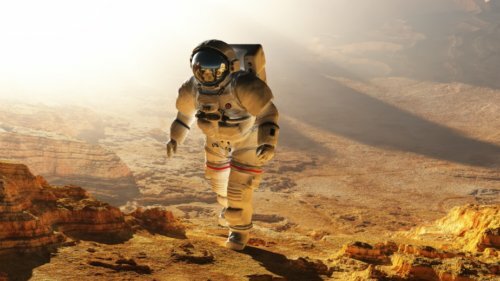 NASA’s Human Research Program has released a report on the medical challenges astronauts will face on an upcoming three year journey to Mars. The hazards faced by astronauts on such a long journey are divided into categories like gravity fields, isolation and confinement, hostile and closed environments, and space radiation. Transitioning from different types of gravity is not an easy process. Going from weightlessness to a planet’s active gravity field can cause disruptions in spatial orientation, coordination, balance, and can cause intense motion sickness. All of these are problematic if someone were to, say, try to land a spacecraft on Mars without crashing. Weightlessness also comes with its own problems, namely bone deterioration and cardiovascular shifts due to the lack of effort the body needs to exert to move. The current plan is to use regular functional task testing to chart and manage balance issues and to use compression cuffs, exercise, and diet to mitigate the other elements. The matter of isolation and confinement is trickier. As one might imagine, NASA has found that behavioral problems among small groups of people jammed into tiny spaces for months or years at a time are inevitable. Mood, morale, interpersonal issues, fatigue, and some degree of depression are almost guaranteed. NASA regularly scrutinizes the team selection process for space missions and it will be applying even more care when choosing for a mission to Mars. Additionally, LED lights that help provide a sense of consistent sleep, stress tests and relieving strategies will be employed. Also tagging along with the astronauts will be a great deal of microbes. A spaceship is basically a giant Petri dish. It is a sealed, small environment that makes transmission more likely, especially when considering how the immune system weakens in space. The spaceship environments are going to be carefully designed and air quality highly monitored in order to minimize contamination and contagion. Most worryingly is the threat of space radiation. The closest idea NASA has to what the Mars travelers would experience comes from the International Space Station (ISS), where residents get ten times the amount of radiation exposure they would on Earth. The problem is that the ISS is still partially within Earth’s atmosphere and has far more protection from space radiation than a Mars shuttle would experience. With the risk of everything from radiation sickness to degenerative diseases, not to mention the deterioration of medicine and food, NASA is currently testing and investigating methods of radiation monitoring and shielding. Although astronauts regularly visit the ISS, standard practice is that no one stays up for more than six months at a time. Astronauts Scott Kelly and Mikhail Korrienko have recently begun a year-long stay at the space station which will be used to learn more about the effects of long-term space travel and biomedical risk reductions. Abadie, L., “Gravity, Who Needs It? NASA Studies Your Body in Space,” NASA web site, November 18, 2015; http://www.nasa.gov/sites/default/files/atoms/files/your_body_six_month_in_space_11_18_15_0.pdf.